The Gossip Girl we love to hate attempted to soften her icy exterior on last night's episode with the most girly accessory of all – ruffles. Now I know what I"ll wear next time I'm trying to ruin everyone else's happiness but look impeccable while doing it. Blair's Bill Blass backless ruffle top ($1990) was tweaked a bit for it's placement on Gossip Girl – but don't worry, if it's a must-have on your list, you too can have your tailor remove the small panel of fabric covering your back for a bare-it-all look like Blair's. $1,990 you say? That's more than rent! Not to worry, we always provide you with similar looks at lower price points, don't we? This antique peach wrap-tie blouse is only $88 and also comes in black. 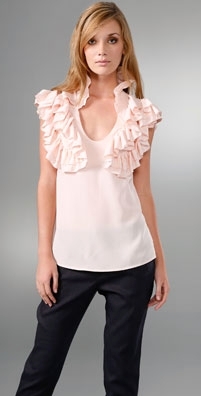 The Geren Ford pink ruffle-front scoop-neck top ($295) has a great girlie vibe to it. And the 12th Street by Cynthia Vincent platinum ruffle front blouse ($169) transforms a razor sharp tuxedo style into a modern feminine evening look.